All artists want to be famous. Those who say that they don't are lying. If you didn't want an audience, then you wouldn't release your creations into the world, and even the most sincere "I'm only doing are for the sake of art" person wants others to see and appreciate their work. Now, they may not want the so-called trappings which come with fame, but they want the fame. There are also those who crave fame and strive for it. Outside of those of us who obsess over movies, only a handful of directors are actually well-known to the general public, and it's safe to say that Quentin Tarantino would be somewhere on that list. But, he clearly wants to be at the top of that list, as he shamelessly promotes himself, as evidenced by the fact that above the title of The Hateful Eight, his latest film, we find "The 8th Film by Quentin Tarantino". Is that important? Shouldn't making a good movie have been more important? The Hateful Eight opens with a stagecoach traveling over the snowy terrain of Wyoming, sometime in the 1870s. Inside, we find bounty hunter John Ruth (Kurt Russell) and his quarry, Daisy Domergue (Jennifer Jason Leigh), and on top is the driver, O.B. (James Parks). The coach soon comes across Major Marquis Warren (Samuel L. Jackson), another bounty hunter, who is stranded in the cold. After taking Warren on-board, Chris Mannix (Walton Goggins) flags down the coach. A blizzard forces O.B. to stare the coach to Minnie's Haberdashery, a way-station near Red Rock. Once inside, the group finds Oswaldo Mobray (Tim Roth), Joe Gage (Michael Madsen), and General Sandy Smithers (Bruce Dern), all of whom are seeking shelter from the storm. As the travelers are going to be trapped at Minnie's while the blizzard rages, they introduce themselves, but John Ruth gets the immediate sense that somewhere there isn't telling the truth about their identity. For 15 years, Tarantino made his name as the leading authority on making hip, gritty, urban movies in which individuals, usually linked to crime in one way or another, spoke fast and lived violently. That changed in 2009 with the release of Inglorious Basterds, a sort-of remake of a little-known World War II film. Tarantino fans chalked this up to the filmmakers enduring passion of exposing the world to obscure cinema. But, he continued down a similar path with 2012's Django Unchained. Similar in spirit to Inglorious Basterds, this was an unofficial continuation of a series of Italian films. 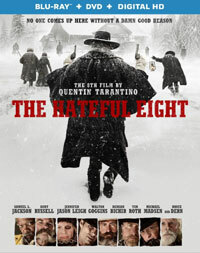 Tarantino clearly liked the period-piece approach of Django Unchained, as he's applied it to The Hateful Eight as well. Tarantino has long-since been accused of stealing from other movies, and he turns to his own catalog here, as The Hateful Eight is essentially a remake of Reservoir Dogs, as we have a group of criminals who are in a single location and spend the film distrusting one another. Just as in Tarantino's first film, The Hateful Eight sees the tension rise as the movie progresses, and the movie is not afraid to be very violent. The difference is that Reservoir Dogs clocks in at 99 minutes, while The Hateful Eight runs for two hours and 47 minutes. Yes, you read that correctly. As noted above, nobody loves them some Quentin Tarantino like Quentin Tarantino, but this may be him at his most self indulgent. Sure, Kill Bill was so long that it became two movies, but at least it had some wacky action scenes. This is just nearly three hours of people talking with some brief, intermittent violence. Obviously, Tarantino is a skilled filmmaker and The Hateful Eight is not a complete disaster, but there are enough misguided decisions here to make the film a disappointment. As one would expect, we get the trademark Tarantino dialogue. Of course, it's been adapted to better fit the time period, but we still get a wealth of profanity and racial slurs. (How many times is the N-word said in this movie?!) And it's undeniably fun to hear Samuel L. Jackson spout Tarantino's words. But, it reaches a point in the first half of the film where we realize that all we are getting are words and very little story. When the actual story finally arrives, The Hateful Eight reveals itself to be a classic murder mystery and it actually gets interesting. But, it borders on being too little, too late. It's as if Tarantino is purposely rewarding those with the patience to sit through the long-winded first act. But, even when we get into the story and a flashback is called upon to fill in the blanks, the flashback contains several minutes worth of needless exterior shots. Tarantino shot the film on 65mm film, which has been used in the past for sweeping, epic films. Using this for a movie which spends much of its running time indoors seems like an odd choice. Therefore, we get pointlessly long outdoor scenes to seemingly justify this. I have a friend who liked The Hateful Eight and I asked her if she would have enjoyed it as much had it been different actors, to which she replied, "Oh no, it would have sucked." And therein lies the problem with this film. On the surface, we have a cast of familiar faces, spouting familiar Tarantino-esque dialogue, and, for this, the movie was given a pass by many. But, further examination reveals what might be Tarantino's laziest movie yet story-wise. The characters aren't that interesting, the twists aren't that shocking, and the dialogue wears thin after a while. What could have been a whip-smart 90-minute movie becomes a test of endurance which becomes a waste of everyone involved. The Hateful Eight is still going on and on somewhere on Blu-ray Disc courtesy of The Weinstein Company. The film has been letterboxed at 2.76:1 and the Disc contains an AVC 1080p HD transfer which runs at an average of 35 Mbps. The image is very sharp and clear, showing no grain and no defects from the source materials. The fact that the snow-covered shots show no grain or noise is a testament to the quality of the transfer. The colors look very good and the image is never overly dark or bright. The level of detail is excellent, as we can see textures on objects, and the depth is good, even in the tight quarters. The Disc carries a DTS-HD Master Audio 5.1 track which runs at 48 kHz and an average of 3.8 Mbps. The track provides clear dialogue and sound effects. The exterior scenes allows the wind to whip through the front and rear channels, while the horse hooves excite the subwoofer. Once inside, we are treated to noises coming from around the room in the surround and front channels, some of which are nicely detailed. The Hateful Eight Blu-ray Disc contains only two extra features. "Beyond the Eight: A Behind-the-Scenes Look" (5 minutes) is a pretty straight-forward EPK which features clips from the film and comments from Tarantino and the cast. They talk about the story and the characters and touch upon the production. "Sam Jackson's Guide to 70mm" (8 minutes) has the actor explaining what a roadshow is and how 70mm works. We also hear from Tarantino and some of the cast who discuss the roadshow experience.